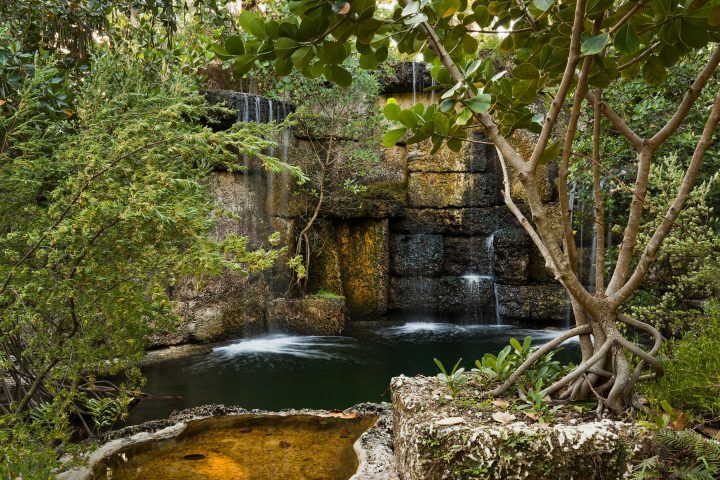 Ventana de la Montana | Raymond Jungles, Inc. 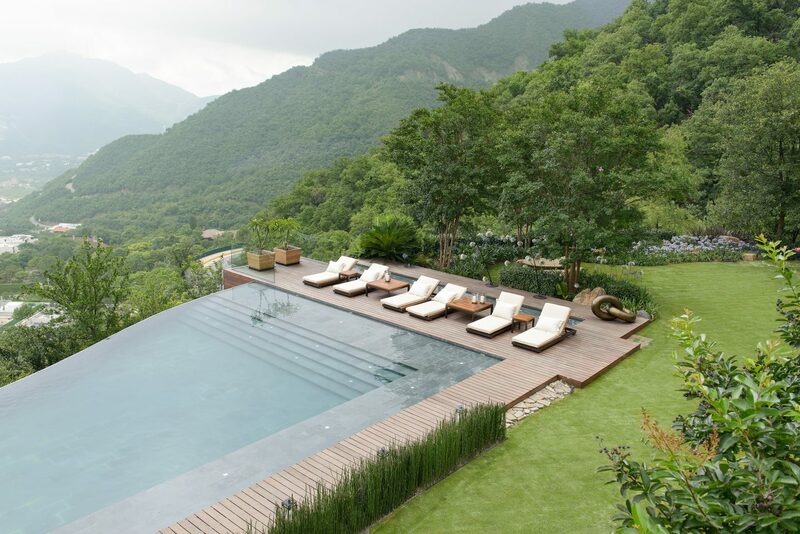 The project was named Ventaña de la Montaña Garden in response to the site’s commanding vistas and distant landmarks including Cerro de las Mitras (Mountain of the Mitres). 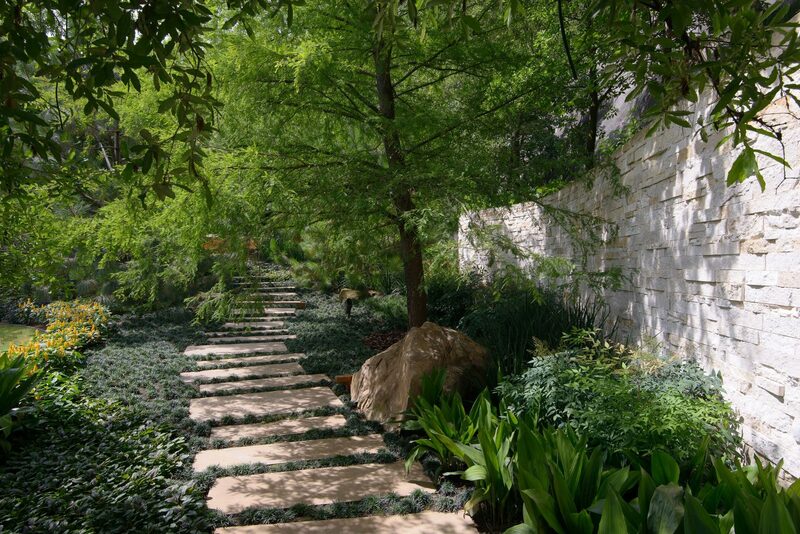 When Raymond was engaged in the project, the major earthwork and architectural plans were complete. 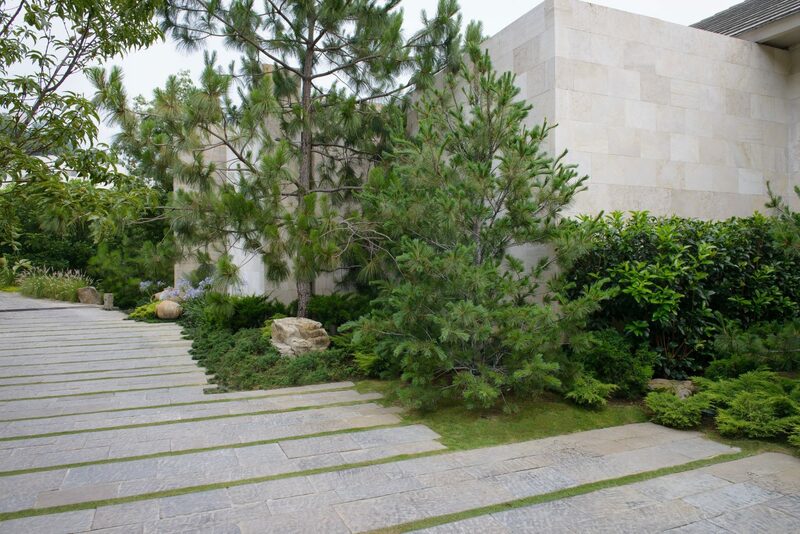 The impact of the garden needed to compliment the architecture’s grand scale. 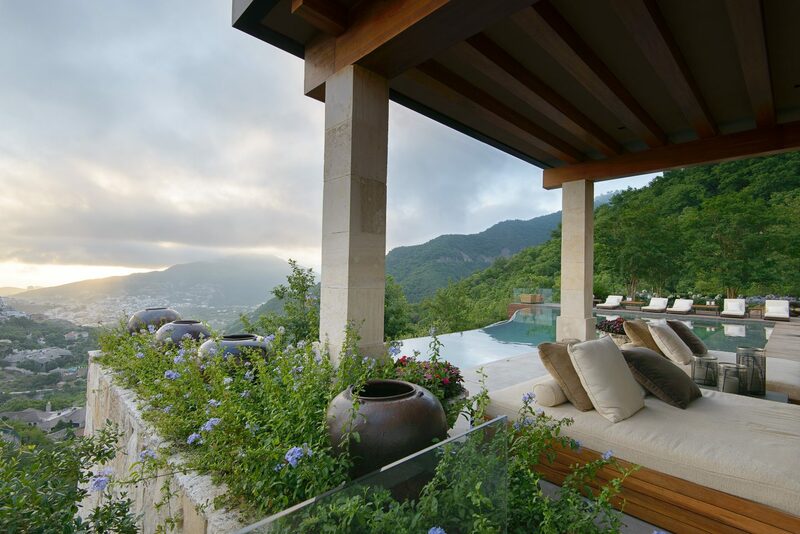 The clients wanted their property to blend in with the vegetation on the mountainside. 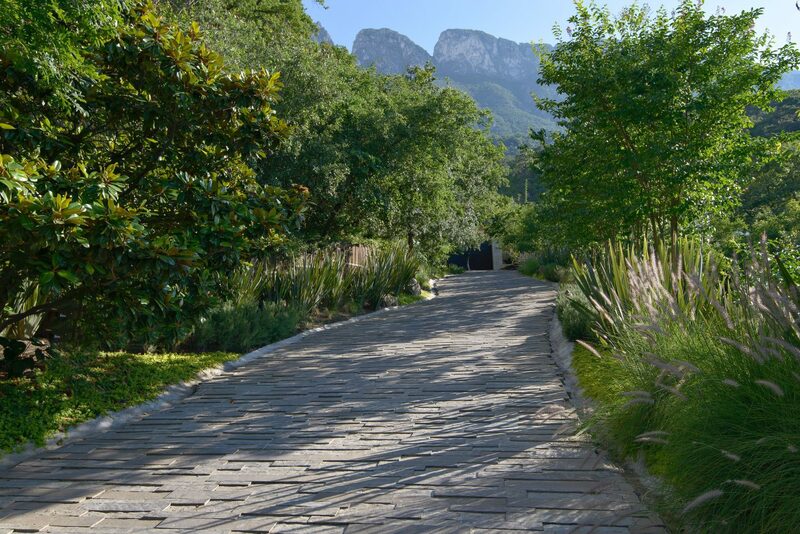 The site is adjacent to Chipinque National Park, a beautiful, undisturbed forest overlooking downtown Monterrey. 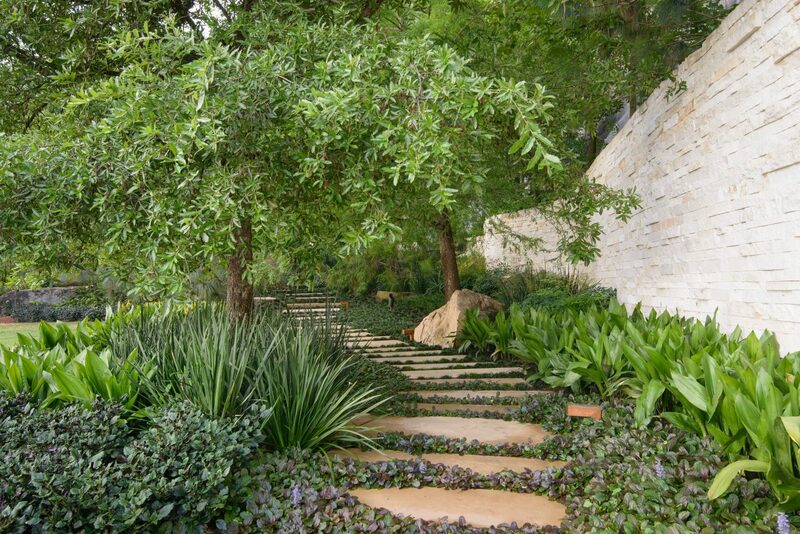 Raymond studied the language of existing plant material, a “Texas palette” of dogwoods, red buds and live oaks—many trees he grew up with as a child in the Midwest. Years ago, the client’s father started a nursery of native trees, knowing that his son would eventually build a home for himself and would need the trees that his father had lovingly grown for him. 95% of the trees on-site were sourced from the nursery. He also visited local nurseries a created a plant list with botanical names for the plants because the common names varied from one part of the city to the other. On the initial visit, Raymond looked at other interesting projects in the area, including the clients’ relatives’ homes to start a dialogue about indigenous stone materials and applications. A significant part of the mountain had been cut away during construction and was coated in concrete to prevent erosion. A decision was made to stain the exposed concrete for a more natural appearance. 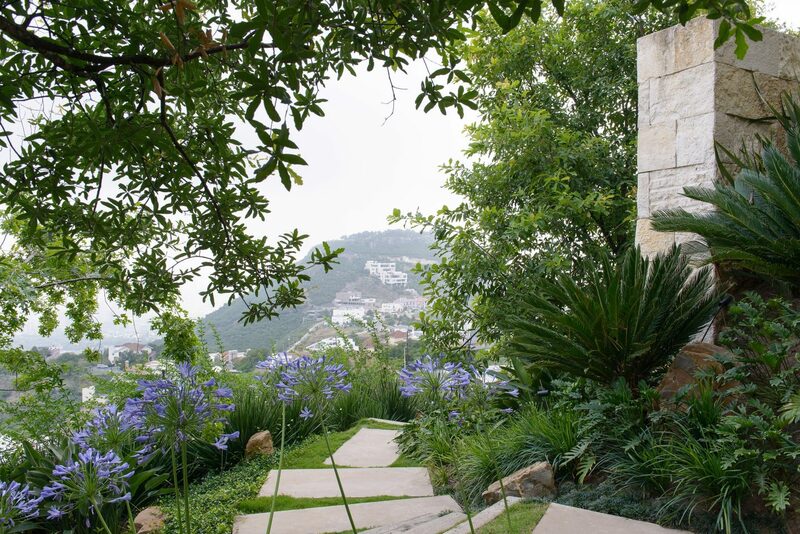 An elevated planter with tall, native trees was designed to mask the utilitarian, reconstructed face of the mountain and reduce the impact of its presence in the garden. The driveway down to the site from the entrance gate was built as a concrete bridge, running alongside the slope of the mountain. 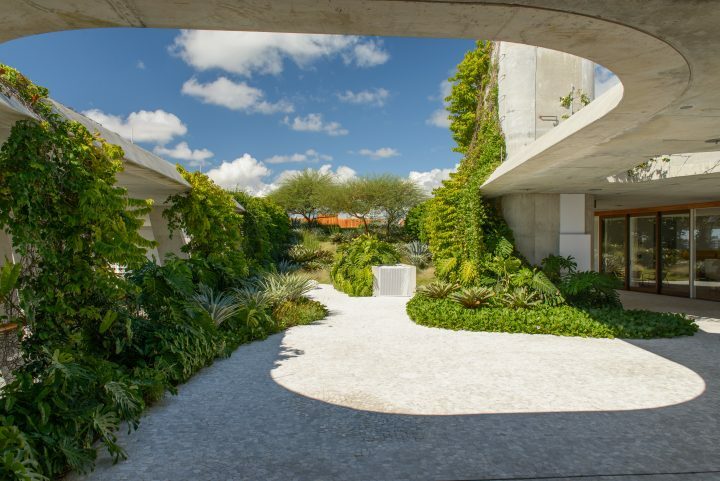 Raymond detailed the planting and incorporated linear planters to evoke a sense of driving on natural grade, not on a bridge. 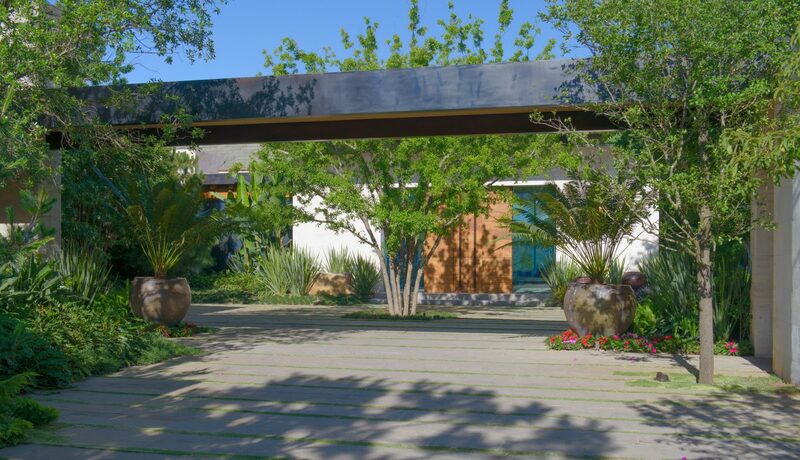 From the lower children’s level, Raymond created a wood deck that cantilevers over the hill. 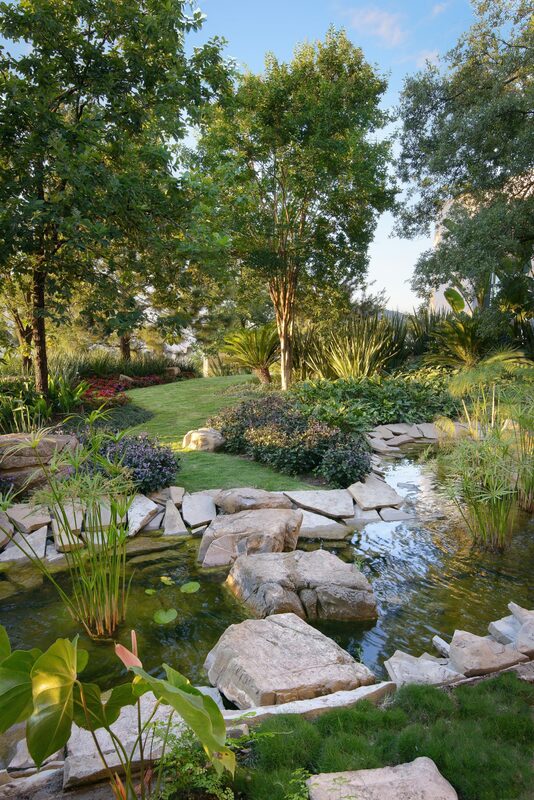 The sunken planter at the edge makes it feel as if you are grounded, not floating fifty feet above. A boardwalk was designed to hang off of the retaining walls for ease of garden maintenance and to provide circulation to the padel court. 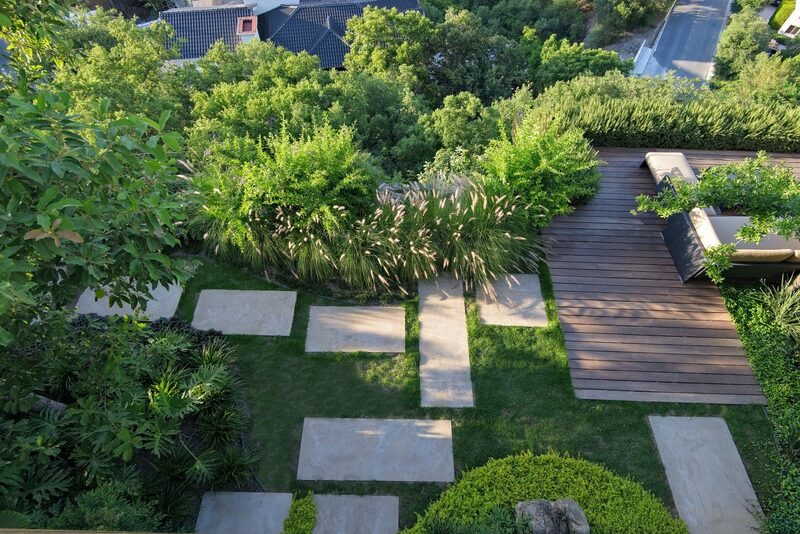 A large lawn area by the pool was designed to accommodate outdoor entertaining. 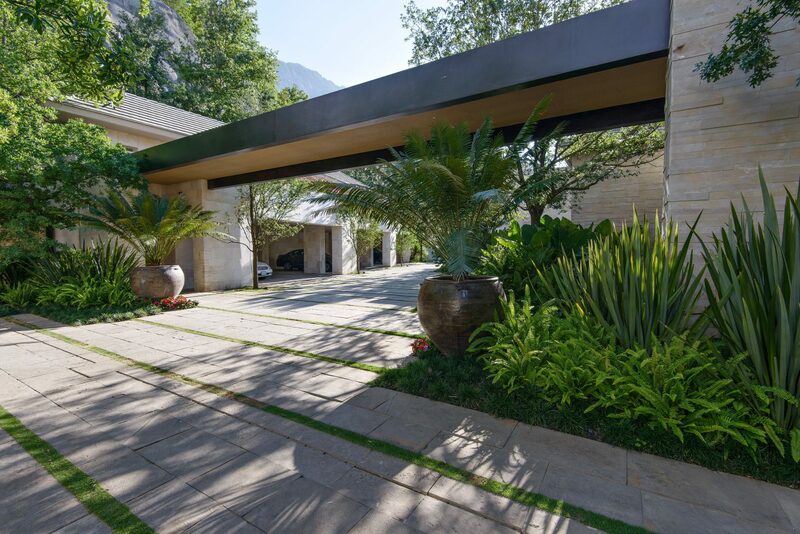 There is a subtle transition to the summer kitchen set beyond the pool area, where Colombian sculptor Hugo Zapata unmasked the essence of a large rock, making it into a seating element. 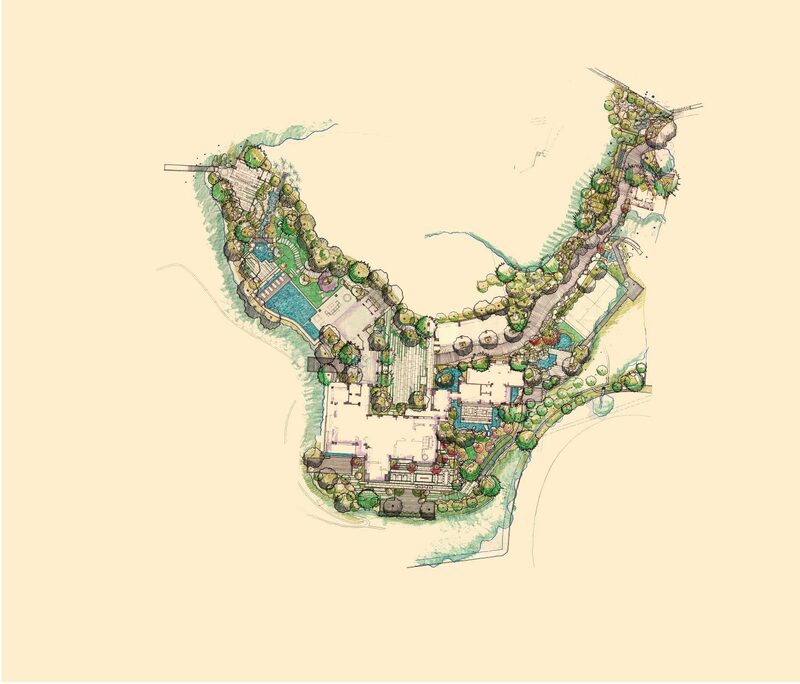 As the firm’s first project in Mexico, it was the first time we presented our plans in English and Spanish. Designing in metric scale proved challenging due to the site’s tremendous topography. Overall, it was fun working with passionate clients who enjoyed planting trees at night via headlamps, setting boulders and drinking tequila.